In general, I don't think food should be wacky. I have no use for purple ketchup, obscure vinegars or smiley shaped fries. But I was bored yesterday and also craving deviled eggs. I really love deviled eggs. I love them so much that I need everyone to love them. I went to college in Canada, where they eat many weird foods, such as poutine and hot chicken sandwich with peas. They do not enjoy many normal foods, such as grits, boiled peanuts and deviled eggs. I think I did a very good thing by introducing those foods to my friends from the North, although I suspect they have no recollection (those were some wild years...) One time, in the middle of the night, I learned that one of my sheltered Canadian friends had never heard of a deviled egg, much less eaten one. Dutifully, I went to the kitchen and made them. Incidentally, the deviled egg is probably an excellent finish to a night of over-indulgence in alcohol. The extra fat and protein might prevent a nasty hangover. The basic deviled egg is easy to make. You probably have the ingredients in your fridge right now. For the truly ignorant (and Canadians), here are the rules. Hard-boil a bunch of eggs. My favorite method is to cover the eggs in a pot in water, about an inch over the top of the eggs. Put the pot on the stove and heat it until the water is boiling. Don't watch it, because it won't boil. Seriously. When the water is at a rolling boil, turn off the heat, cover the pot and let the eggs sit for 15 minutes, just enough time to ask the baby if he would like you to pay his big brothers to play with him. You should have a few minutes left to negotiate price with the big brothers. If you don't have any money, cry a little and give them a speech about it being Father's Day and how all Daddy wants is some deviled eggs (Lie #1) and you can't make them unless they help with the baby (Lie #2). Make them play outside so they can't see you looking at cool shoes on the internet while the watched pot boils. By the way, I hope you remembered to get organic, cage free eggs from Wil-Moore Farms at the All-Local Market Saturday. Aren't they pretty? Drain the water and shock the eggs with ice. Let them cool. Peel the eggs and slice them in half, long ways. Dump the yolks in one bowl and arrange the empty, boat-like whites on a platter. Advanced deviled egg makers (or posers) will want a platter made specifically for the serving of deviled eggs. I have a nice white one from the Gourmet Shop. Do not get confused and buy an oyster platter, although you should have one of those, too, because you never know when you might need it. To the bowl of cooked yolks, add a big blob of mayonnaise, preferably Duke's and definitely not Miracle Whip. A heaping half cup should do for about a dozen egg yolks. Add enough mustard to make you happy, maybe a tablespoon or two. Sprinkle in some salt and white pepper and mix everything together until it's smooth. You can use a hand blender, but I find a fork does the trick for a small batch. If you are very fancy, put the mixture in a plastic bag and squirt it, cake decorator style, into the egg boats. I just chuck it in there with a spoon. I use my fingers to get the extra off of the spoon. Sometimes I even lick them (my fingers, not the spoon, which shouldn't be licked until the end.) Are you grossed out? Purists should sprinkle the tops of the finished eggs with Paprika. If you want to get wacky, try dill or celery salt. 1/3 cup sliced black olives. A small blob of anchovy paste. To be honest, I didn't love these, even though they looked cool. Something about the olives wasn't quite right. I asked my husband if he liked them and, after a second of thought, he said he did. I asked him if he would eat another one if he had them at a party. After more thought and a moment alone, he said he would eat another one. Take that for what it's worth. Equal parts mayonnaise and ajvar, about 6 tablespoons each for a dozen yolks. Simple and good. I garnished them with parsley, mostly because it made me feel cool to use something I actually grew. 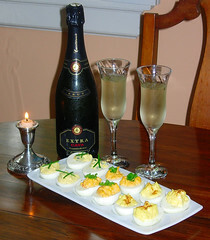 And here are some serving suggestions, for those of you unfamiliar with deviled eggs. 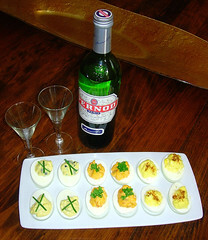 Perhaps you would like to serve the deviled eggs during a long night of drinking grape brandy with Serbs. They will need the eggs to cushion the alcohol. Well, they might not, but you will, if you want to try to keep up. Maybe you would like to spend the late afternoon and early evening trading stories with a French person, in which case you might like to serve the eggs with pastis. Although the photograph below features Pernod, I should mention that my husband and I much prefer Ricard, because Pernod tastes kind of soapy. Perhaps you are planning a romantic evening. Deviled eggs are perfect for any occasion. They have the added bonus of being high in protein, if you need energy for any sort of acrobatics. Ahem. Taking a cue from the food photographers of the seventies, I've included a lit candle and a bottle of cheap bubbly in the picture. Nothing says "romance" like a lit candle and some cheap bubbly. This one is a cava, and actually quite good. I should know, I've certainly had a lot of it. For those of you who are into close-ups of food, and I know you're out there, here are the three different types of eggs. From left to right, you can see traditional, ajvar infused and anchovy and olive deviled eggs. And that is what I did yesterday, so the kids would think I was too busy to play Apples to Apples or Monopoly. * For the record, I think it's awesome that the AAP had the huevos to issue a statement just saying no television for babies under two. Obviously, I agree, since we don't even own an actual television. But it's summer, I have three children and no nanny and I needed wanted to make the damn eggs without a baby on my leg. "Nemo" is my friend, okay? Yes those eggs are all well and good. Food of the gods I tell ya, the GODS! For the record, I miss poutine very, very, very much. I wish I could buy or make the sauce. If anyone has a recipe, I'd be very grateful if they would send it to me! Your OG deviled eggs recipe is just like mine, except I add a splash of white wine vinegar and a sprinkle of dill. Yummm. The white wine vinegar adds a nice tanginess to it. 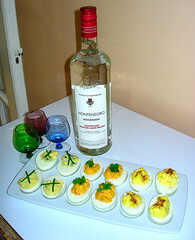 Very cute ideas, deviled egges are like a canvas, simply a canvas for many an idea.